Tokyo Fragments is a collection of short stories that were specially commissioned from five of Japan’s leading contemporary writers of fiction. The individual tales, which are designed to merge to form a composite portrait of modern Tokyo, present the city and its inhabitants in all their variety, from dropout students sniffing glue in the sleaze of Shinjuku to social climbers playing at love in glitzy Aoyama. 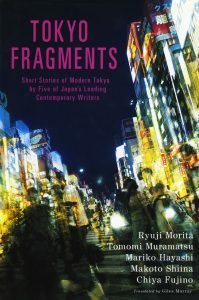 Tokyo Fragments includes stories by Chiya Fujino, winner of the Akutagawa prize in 1999, as well as Mariko Hayashi, Makoto Shiina, Tomomi Muramatsu and Ryuji Morita.